Most ships dock in Manhattan on the West Side; the passenger ship terminals are located off the West Side Highway (12th Avenue) and span several blocks of the West 50s. It is about a 15 minute walk from Midtown. This is by far the best location for cruise passengers. Some dock at he passenger ship terminal located in Brooklyn's Red Hook neighborhood with nice views of the NY skyline. Taxis are your best choice here as there is little within walking distance. The terminal has very few facilities. For public transport use the MTA website. At night a taxi is recommended. Royal Caribbean docks at Cape Liberty Cruise Port, on the New Jersey side of New York Harbor. See more details here. Please click here to see all New York area airports and their ground transportation possibilities. Parking is $35 a day at the Manhattan facility, $19 a day at Cape Liberty and $20 in Brooklyn. Hotels in the Big Apple. Cruise calendar for Manhattan and Brooklyn Terminals. Cruise Schedule for Cape Liberty. Check here for festivals and events in New York City when you are in port. New York! What an amazing place---exciting, inspiring, intriguing, even intimidating! But once experienced, this city's impact will never be forgotten! Its ranking as one of the world's most popular travel destinations is well-deserved. Travelers by the millions are drawn to New York, for there is something here for everyone. This is the home of the Statue of Liberty and Ellis Island, the Empire State Building and the Chrysler Building, Wall Street and Madison Avenue and Time Square with its dazzling theater district. Here you will find the bright lights of Broadway and the tree-lined paths of Central Park, world-renowned museums and awe-inspiring cathedrals, quiet residential neighborhoods and bustling sky-scrapered streets. The United Nations, Rockefeller Center, Lincoln Center, Little Italy, Chinatown, Harlem-- the list goes on and on! This small island is indeed a pulse-point of the world! Although it may seem impossible to see and do everything in this aptly nick-named "city that never sleeps,"
This part of New York has a little something for everyone. Here you'll see the Brooklyn Bridge, Trinity Church and St. Paul's Chapel, South Street Seaport, and the terminal for the Staten Island Ferry, City Hall, Battery Park, Castle Clinton. and Federal Hall where George Washington was inaugurated. This area is at the very heart of international finances. You'll walk down Wall Street, see the frenzied New York Stock Exchange and Mercantile Exchange, The World Financial Center with its beautiful Winter Garden, and Federal Reserve Bank. You'll see Bowling Green Park, where Peter Minuit traded $24 worth of goods for Manhattan Island, and you can rub the nose of the "Charging Bull" for good luck, just like Wall Street investors do. (It's a 7000-pound bronze sculpture that mysteriously appeared in Bowling Green Park in 1989!) Time permitting, you might even grab a burger at the only McDonald's in the world with a ticker tape from the New York Stock Exchange flashing across the main dining hall! Gazing at the 36 million astounding specimens displayed here – from the mammoth and great dinosaurs of prehistoric times to a fragment of the oldest rock in the universe. The diversity of the exhibits is mind-boggling! If this isn't enough, there's also an IMAX Theater, other special exhibitions and programs, and - opening in April, 2000 – the Rose Center for Earth and Space with a new state-of-the-art Hayden Planetarium, the most technologically advanced Space Theater in the world. This museum is a must-see for everyone who visits New York! Although you won't feel as if you've left New York when we enter the grounds of the United Nations, officially we will have entered an international zone where the land does not belong to the United States, but to all the countries that have joined the United Nations. It has its own police and fire forces, post office, and six official languages – Arabic, Chinese, English, French, Russian, and Spanish. So regardless of who you are or where you live, this is your organization, and its goal is to promote peace, preserve the environment, and create a better way of life for all mankind. One of the most memorable attractions of New York City is the city itself! To get some perspective on the magnitude of this city, you have to see it from a distance. There are several great ways to do this. On a harbor cruise, using a Circle Line Boat or the Staten Island Ferry you can view this vast skyline from the water. For a "bird's eye view," nothing beats the panorama from the top or the Empire State Building. 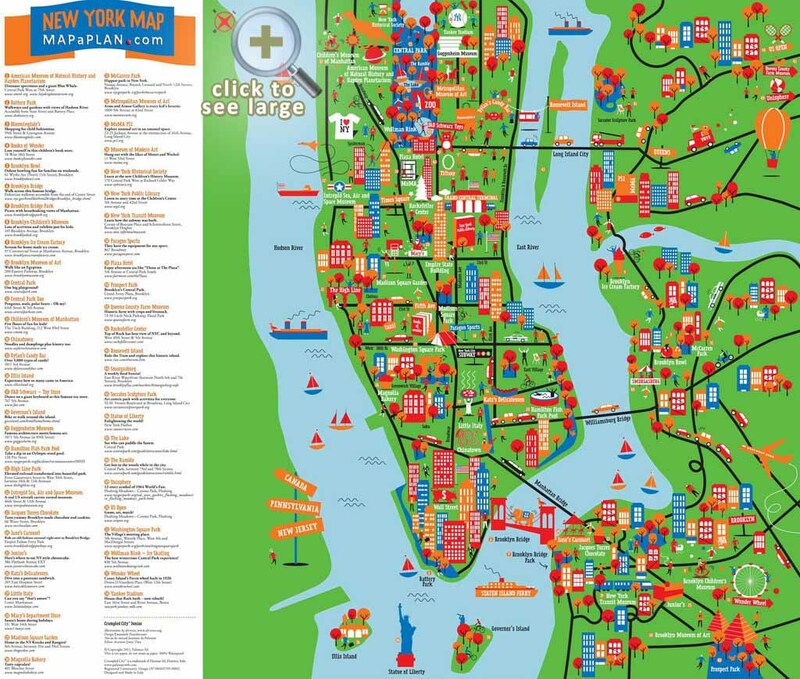 From the water or the air, you'll be amazed at just how big the "The Big Apple" really is. Until you've seen Times Square at night, you haven't really seen New York. Dazzling lights illuminate the area; pedestrians from every corner of the world converge; a cacophony of sounds from street musicians to taxi horns fills the air; dozens of theaters each present world-class performances; restaurants and shops beckon you to come and take a look. This general hub-bub of activity makes Times Square a place like no other. As the song suggests, "There's no business like show business," and there's no better place to experience it than Times Square. Central Park is an 843-acre green oasis in the heart of New York. Here you'll stroll along some of the 58 miles of tree-lined paths, or people-watch from the shady park benches. You're likely to see mothers with strollers, dog walkers, joggers and in-line skaters, impromptu concerts, and more. At the south end of the park there is a wonderful little zoo, Central Park Wildlife Center, and Wollman Skating Rink. Strawberry Fields (a tribute to John Lennon) and Sheep Meadow are on the west side of the park and are designated places for quiet meditation. New Yorkers and visitors alike enjoy this park as a welcome respite from the bustling city streets. The Statue of Liberty, unveiled on October 28, 1886, was given to the United States from France as a gesture of friendship between the two countries, but it quickly became more than just a gift. With her torch raised 151 feet above New York Harbor, this phenomenal monument became a symbol of hope and freedom to the world. Even today the Statue of Liberty is an inspirational sight -- it is easy to imagine what those immigrants must have felt as they entered the harbor. After long, difficult voyages, Lady Liberty was there, welcoming them to America and beckoning them to their new home. Ellis Island was the gateway to this new home. With over 12 million immigrants passing through here between 1892 and 1954, more than 4 out of 10 Americans can trace their ancestry to this port of entry. New York is a city of top-notch museums, but two that are absolutely overwhelming are the Metropolitan Museum of Art and the Museum of Modern Art. The Metropolitan Museum of Art is one of the largest museums in the world and displays masterpieces from nearly all the world's cultures. With 5 million visitors a year, it attracts more people than any other site in New York City. MoMA (as the Museum of Modern Art is known) has the world's greatest collection of modern art, from Van Gogh to Monet to Picasso and more.